The location was good. The internet was fast, the shower has lot of water what was good because usually hotels cut of the water a little bit. There is a free phone that you can take out, it has internet. The view was ok. The room size was ok.
What i like about the property is that it’s 10-15 mins away from cauesway. Also they offer free shuttle service going to some of the main hub/tourist spots. Their staff is very accommodating. Stuff at the beginning was very kind and helpful. Maid service is very nice . Room was clean! Quick walk to the station and near to bus stops. Good location ,good free breakfast friendly and helpful staff. A mobile phone with unlimited internet connection is ready in your room and can be take out during your stay. 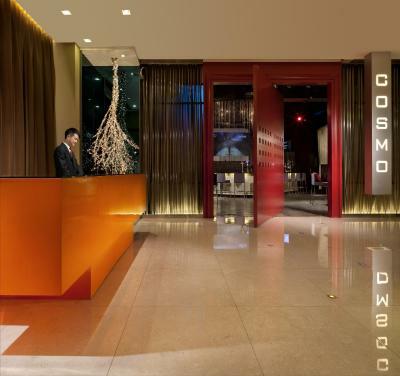 Cosmo Hotel Hong Kong This rating is a reflection of how the property compares to the industry standard when it comes to price, facilities and services available. It's based on a self-evaluation by the property. Use this rating to help choose your stay! One of our best sellers in Hong Kong! 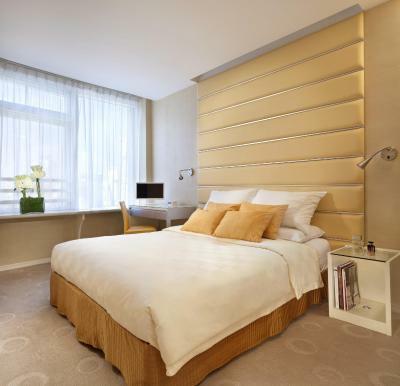 Around a 10-minute walk from Causeway Bay MTR Station, the stylish Cosmo Hotel Hong Kong is a 4-star boutique hotel offering free area shuttles and free WiFi. All guest rooms provide free use of a smartphone with unlimited 4G Internet supported with WiFi data sharing function to share a connection with one’s own mobiles, tablets and other devices, free local calls, and IDD calls to 8 countries including Mainland China, US, Canada, Singapore, Korea, UK, Australia and Thailand. This smartphone can be used both in and out of the hotel. Complimentary coffee and WiFi are available at Breeze Cafe. 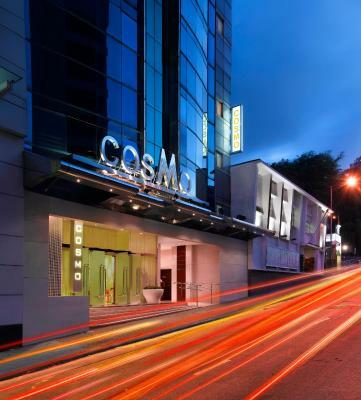 Located between Causeway Bay and Wan Chai on Hong Kong Island, Cosmo Hotel Hong Kong is around 10 minutes' walk from Times Square Shopping Mall. 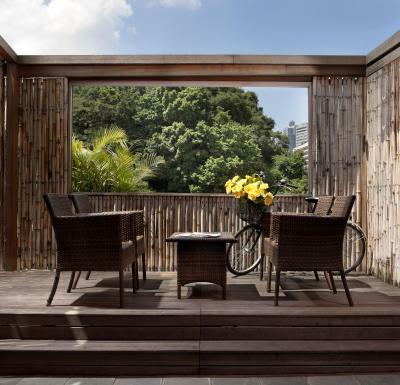 It is about a 45-minute drive from Hong Kong International Airport. Airport shuttles are available at an extra charge. Rooms are cozy with large windows that allow natural light in. 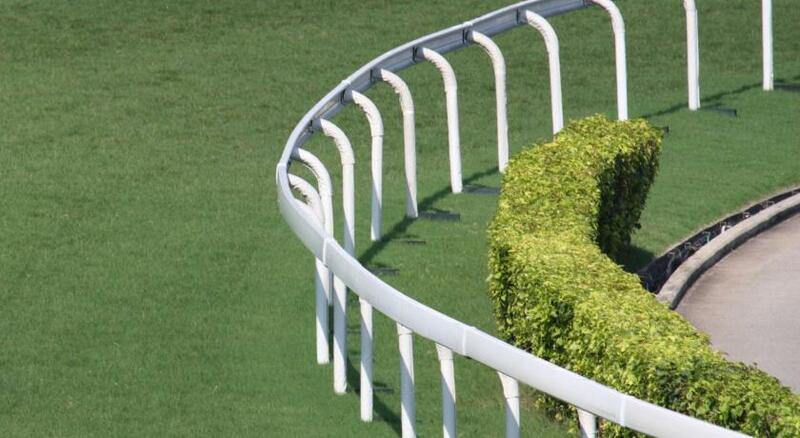 They are fitted with a flat-screen cable TV and tea/coffee making facilities. 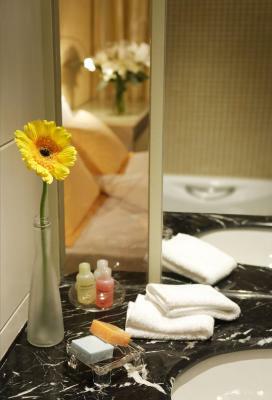 Each room has an private bathroom with toiletries and a hairdryer. 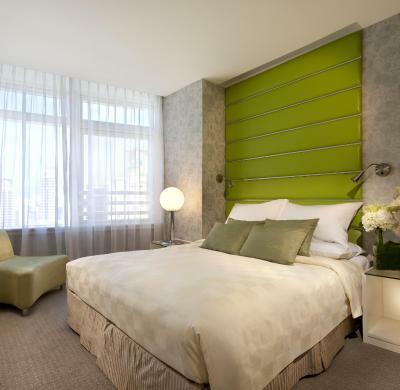 Hotel Cosmo provides free parking on site and has a tour desk to provide travel assistance. 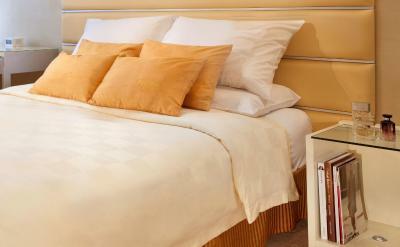 For guests' comfort, it also provides laundry and dry cleaning services. International buffet spread is available at Nooch Bar every morning. 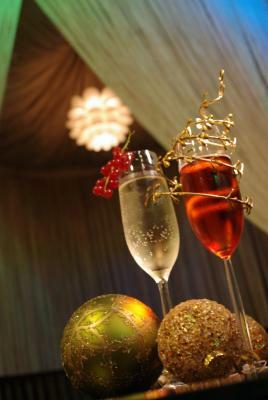 Guests can also enjoy great music and award-winning cocktails. 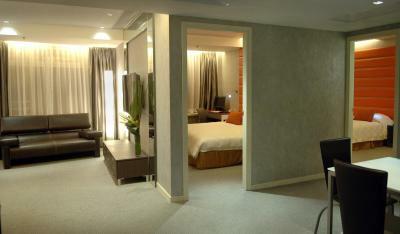 When would you like to stay at Cosmo Hotel Hong Kong? Located on the floors 5 to 27, this room is decorated in yellow or orange colored themes. Complimentary use of a smartphone with unlimited 4G Internet supported with WiFi data sharing function to share a connection with one’s own mobiles, tablets and other devices, free local calls, and IDD calls to selected countries. This smartphone can be used both in and out of the hotel. Located on the floors 5 to 12, this room is decorated in yellow, green or orange colored themes. Complimentary use of a smartphone with unlimited 4G Internet supported with WiFi data sharing function to share a connection with one’s own mobiles, tablets and other devices, free local calls, and IDD calls to selected countries. This smartphone can be used both in and out of the hotel. Located on the floors 15 to 27, this room offers Causeway Bay city views and is decorated in yellow, green or orange colored themes. Complimentary use of a smartphone with unlimited 4G Internet supported with WiFi data sharing function to share a connection with one’s own mobiles, tablets and other devices, free local calls, and IDD calls to selected countries. This smartphone can be used both in and out of the hotel. 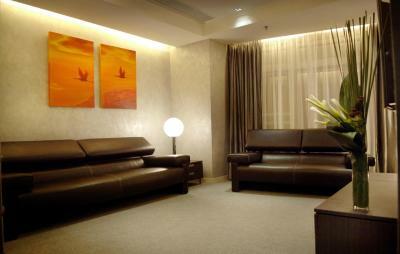 Located on the floors 10 to 27, this studio offers is decorated with a yellow colored theme. Complimentary use of a smartphone with unlimited 4G Internet supported with WiFi data sharing function to share a connection with one’s own mobiles, tablets and other devices, free local calls, and IDD calls to selected countries. This smartphone can be used both in and out of the hotel. Features 2 bedrooms, both with a bathroom, this suite has a separate living and dining areas and a pantry with a microwave oven. Extras offer a 42-inch flat-screen TV with cable and satellite channels, writing desk and mini-bar. The bedroom and bathroom are partially divided by sheer glass. Complimentary use of a smartphone with unlimited 4G Internet supported with WiFi data sharing function to share a connection with one’s own mobiles, tablets and other devices, free local calls, and IDD calls to selected countries. This smartphone can be used both in and out of the hotel. Room features a flat-screen TV with 30 cable and satellite channels, a work desk, mini-bar, hairdryer, tea/coffee maker, free bottled water and in-room safe. - A 3-hour use of airport lounge access at Hong Kong International Airport (for booking of 2 consecutive nights or more, 1 airport lounge access card per room and each card entitles to single entry only). Hotel offers free shuttle to 15 places like metro MTR station, Convention Centre, IFC shopping mall (Airport Express Line HK Station), Pacific Place and Central Harbourfront (Star Ferry Pier). 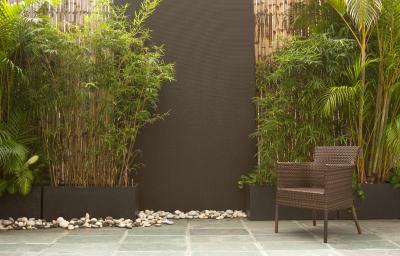 It is a smoke-free EarthCheck’s bronze hotel. 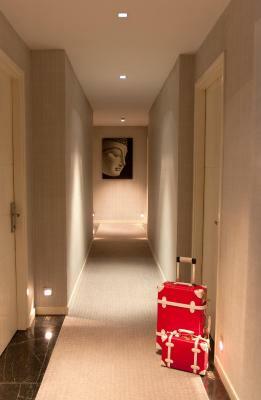 House Rules Cosmo Hotel Hong Kong takes special requests – add in the next step! Cosmo Hotel Hong Kong accepts these cards and reserves the right to temporarily hold an amount prior to arrival. - The hotel has a 100% indoor smoke-free policy. Smoking is only allowed in certain outdoor areas of the hotel. 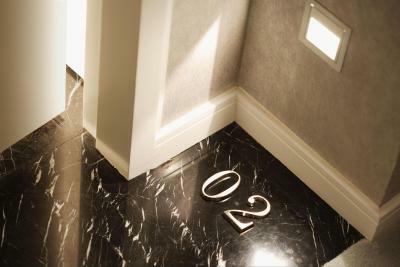 - The hotel reserves the right to pre-authorize guests' credit card for the entire period of stay prior to arrival. If a debit card is provided for such purpose, the related amount will be deducted by the bank during the pre-authorizing process, and the hotel shall not be responsible for this under any circumstances. - Guests are required to show a photo identification and the same credit card used for booking at the time of check-in. The name on the credit card must be the same as the guest checking-in. All rooms include complimentary use of a smartphone with unlimited 4G Internet supported with WiFi data sharing function to share a connection with one’s own mobiles, tablets and other devices, free local calls, and IDD calls to selected countries. This smartphone can be used both in and out of the hotel. If you wish to change guest names or add guest names after your reservation is confirmed, please contact the hotel directly for information. Very dated but it was functional , staff were very nice - so for the price was good . There for the rugby 7 so worked as drop & go ! Too noisy, Drunk people. you cant practically not hear anything from outside because the window is sound proof, but the walls are really thin and you can hear what other people is doing on the other rooms. Next to our room was a noisy kid that seems to be destroying the room, kicking the doors and walls, trowing and breaking things every night, in the room in front of us there were some noisy backpackers. It was normal to see people walking in underwear. Drunk people drinking alcohol inside the hotel. Good location for the rugby 7's, staff very helpful. Bus stop outside and reasonably close to the MTR. Location to both city and airport relies heavily on the hotel shuttle service which operates on first come first served basis.